If you’ve had missing teeth for several years, your jawbone structure has likely deteriorated over time. What’s worse is that many patients don’t realize that this has happened until they explore the possibility of replacing their lost teeth with dental implants, which require a certain amount of healthy jawbone for their surgical insertion. While patients may not be candidates for this type of tooth replacement in this circumstance, there is a way to regain the healthy tissue you need for a strong, recompleted smile – bone grafting. Here in St. Louis, Dr. Moreland offers both minor and major bone grafts for patients in need, so don’t hesitate to contact our oral surgery office if you’d like to learn more. 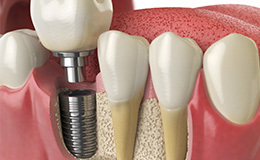 Do I Have Enough Healthy Bone for a Dental Implant? 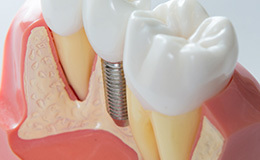 When a tooth is extracted, the walls around the socket may be thick or thin in nature. Thick walls will most likely fill with bone over the course of a few months, but thin walls (such as the ones found around the upper and lower front teeth) may not heal quite so predictably. In these situations, Dr. Moreland strongly recommends the placement of a bone graft as soon as possible to preserve the jawbone. This will help maintain the natural width and volume of the existing bone so that dental implants can be successfully placed once a patient has recovered from the extraction. What is the Difference Between Minor & Major Bone Grafting? Minor bone grafting can help repair implant sites that are less than adequate because of a variety of reasons, from previous extractions to injuries to the presence of advanced gum disease. Our team will either transfer bone from elsewhere in the body (such as the hip, the tibia, or elsewhere in the jaw) or use a tissue bank. Additionally, we may recommend the placement of special membranes that help protect the bone graft and encourage healthy regeneration. This is known as guided bone/tissue regeneration. On the other hand, major bone grafts are typically the right course of action if the patient has a serious jaw defect. These types of defects can be congenital in nature or arise because of traumatic injuries or the surgical removal of a tumor. In most cases, we will use the patient’s own bone structure to correct the issue, transferring tissue from the hip, knee, skull, or other common donor sites. This type of treatment will require a hospital stay in most cases, so please keep that in mind when exploring treatment. In addition to improving the health of the socket walls for implant placement, bone grafting may also be recommended for patients with very large or low-hanging sinus cavities. This tends to happen when a patient’s natural teeth were removed many years ago. In this situation, Dr. Moreland will perform sinus grafting, which can be done right here in our office (most of the time) with sedation dentistry. Our team will locate the membrane that surrounds your sinus and elevate it, adding bone underneath to support the placement of one or more implants. 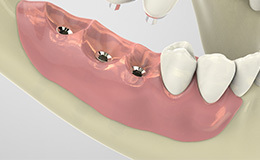 In fact, we may be able to finish the sinus graft and place the dental implant(s) in the same visit! Also known as autografts, this type of graft is created using a patient’s own bone that’s been harvested elsewhere in the body. Possible options include the hip, lower leg bone, chin, skull, or jaw. Autogenous bone grafts are typically recommended by Dr. Moreland when possible because the material is already your own bone, which means that it’s better at enhancing natural bone regeneration while minimizing the risk of rejection. However, one important downside is that patients will have to undergo the harvesting procedure, which may not always be the best course of action for each specific patient. Also known as allografts, this type of graft is made using bone structure that comes from a cadaver. It is freeze-dried, and water is extracted from the structure through a vacuum. Unlike autogenous bone, this type of graft cannot encourage new bone growth all alone. 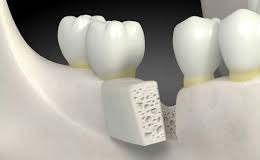 Instead, Dr. Moreland uses it like the framework for a new house, allowing surrounding bone to cover it and correct any defect and/or void at hand. Xenogenic bone comes from the non-living bone of a different species – typically a cow. This bone is processed at extremely high temperatures so that patients aren’t at risk for general contamination or immune rejection. Like allogenic grafts, xenogenic grafts help develop a strong, stable framework in the patient’s jawbone that will support the growth of surrounding natural bone. The biggest advantage of both allogenic bone and xenogenic bone is that they do NOT require patients to undergo two separate procedures. However, patients should keep in mind that they will likely take longer than an autograft and provide less predictable results overall. What are Some Possible Bone Graft Substitutes? Demineralized Bone Matrix (DBM/Demineralized Free-Dried Bone Allograft (DFDA) – This processed allograft bone contains growth factors, proteins, and collagen that are directly extracted from the original structure. It can come in the form of a gel that’s injected through a syringe, physical chips, powder, or putty. Bone Morphogenetic Proteins – Also known as BMPs, these types of proteins are naturally produced in a person’s body. Their purpose is to promote and regulate safe, healthy bone formation. 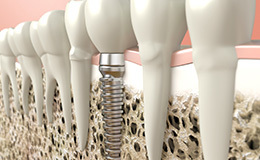 Graft Composites – Graft composites contain various bone graft materials and growth factors. Different combinations include DBM and bone marrow cells, a composite of collagen/autografts/ceramic, and a collagen/ceramic composite. When using synthetic materials, Dr. Moreland won’t have to subject you to a separate procedure for harvesting bone, which will help reduce overall risk and discomfort. We’ll be happy to help you determine which type of bone graft is the best fit for your unique needs!